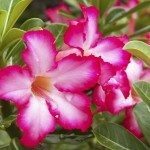 how to take care of a Desert Rose plant? I live in a garden apt and want to know if I can put this plant in a shallow bowl and display it on my small table on the smaller porch area. The interesting root seams to be the focal point. What do I do with it in the winter?